We are pleased that on Thursday, September 11, 2008, the Grand Lodge of Iowa conducted a Cornerstone Laying Ceremony at the Masonic Wall on the Trout Run Trail. The ceremony was a public event and took place at the Wall at 5:30 P.M.
Public Officials from the Decorah area were present as well as representatives from the Press. Click here to see pictures from the event. T he picture below was taken at the construction site at the Decorah Trout Hatchery when the Masonic Donation was announced to the public. From left to right Brian Malaise, Manager Decorah Fish Hatchery, Karl Jacobsen, Masonic Project Committee Chairman, Thomas Raulerson, Past Worshipful Master, Great Lights Masonic Lodge Nr 181, Mike Huinker, President, Trails of Winneshiek, Kirk Johnson, Fund Raising Committee, Trails of Winneshiek. A message from Karl Jacobsen, Committee Chairman (November 26, 2007). 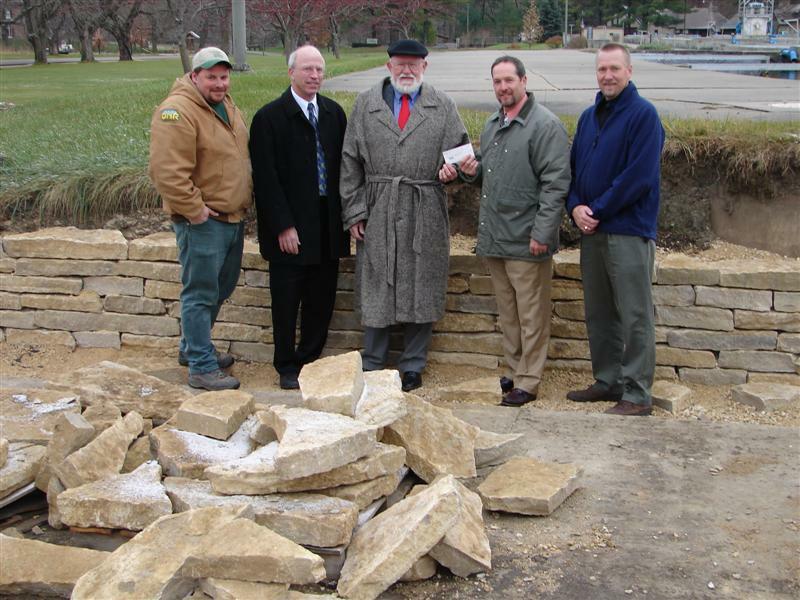 The photo is scheduled to appear in the Decorah Newspapers in the next week or two announcing our Lodge's decision to raise $10,000 to name the stone wall being constructed at the Decorah Fish Hatchery for the Trails of Winneshiek Trail. The vote was to pay $5,000 from the treasury and raise the remainder from membership. Write on your check in the note space: "For Masonic Wall G.L.#181"
Brenda will tally the amounts given and forward them to the Winneshiek Community Foundation which is collecting the funds for payment. Our goal is to have $1700 raised each of the next three years and have the pledged total paid by 2011. If excess donations are received, they will go to help pay the actual cost of the wall which totals $18,000. In the wall will be a sandstone stone with "Great Lights Masonic Lodge #181" and the Masonic Square and Compass next to it and the year 2007 at the bottom. The wall is being constructed as we speak and offers a wonderful view of the eagle's nest at the park from it's location. Please let me know if you have any questions. I look forward to working with our committee to see this fund raising effort is successful.